Step 1) Get a large pot of water for your pasta on the stove over medium-high heat. Have a basket or strainer insert for the pot. The MOST important part of this dish turning out correctly is the proper Italian way of finishing your pasta in your sauce. See Step 6 below. 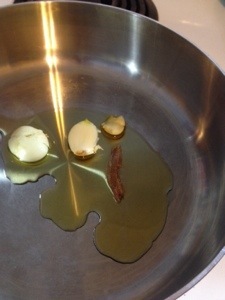 Step 2) Put a large pan, larger than you think you will need, over medium heat and add the olive oil. 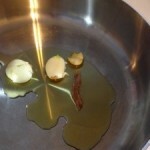 Step 3) When the oil is hot and shimmering, add 2 crushed garlic cloves and the anchovy. 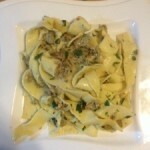 Stir frequently as the garlic flavors the oil and the anchovy dissolves. 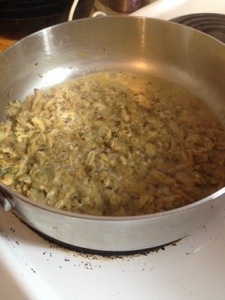 Step 4) When you smell the garlic and the anchovy is gone, remove the cloves. 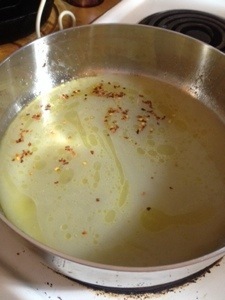 Add the clam juice, white wine, and red pepper flakes. Increase the heat to medium-high and let the sauce reduce. Step 5) About now, the pasta water should be coming to a rolling boil – salt it, let it reboil and drop the pasta. At the same time, add the clams to the sauce. Stir both as they cook. Step 5A) Since I used fresh pasta, I dropped the clams into the sauce before the pasta dropped because it only needed 2 minutes in the water. Step 6) Pull the pasta from the water in the strainer 1-2 minutes before it is “al dente” and transfer to your sauce. 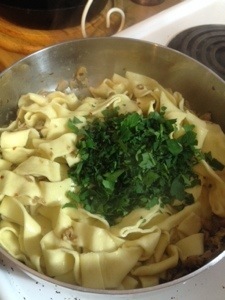 Add the parsley. Now stir to coat the pasta and make sure your sauce is thick enough. 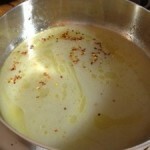 Step 7) If the sauce is too thick, add a tablespoon of the pasta water, if too thin, let it reduce slightly or pull the French cooking trick of adding a pat of butter to thicken it. Serve and enjoy with a glass of that white wine. 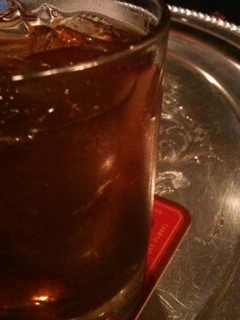 The secret of this sauce is that it is not a sopping sauce. 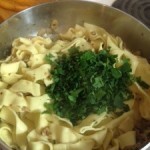 There should be just enough liquid to coat every noodle and nary a drop draining to the plate. If you think you have let too much boil off, add a little bit of the pasta’s cooking water to thin the sauce while cooking. 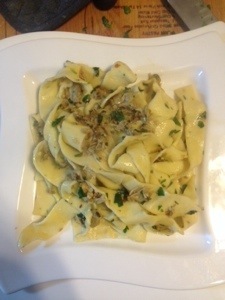 Step 4A) When you smell the garlic and the anchovy is gone, remove the cloves. Add half cup of water, the white wine, red pepper flakes, and clams. Put a lid on the pan and let the clams open. Step 4B ) After approximately 5 minutes, your fresh clams should be popping open. 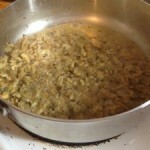 Take the lid off and remove the clams, draining the clam back into the pan as you remove them. Discard any unopened clams. 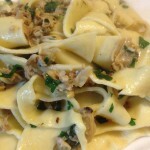 Remove the clam meat from the shells and chop if so desired. From here, go back to the original Step 5 and proceed through. 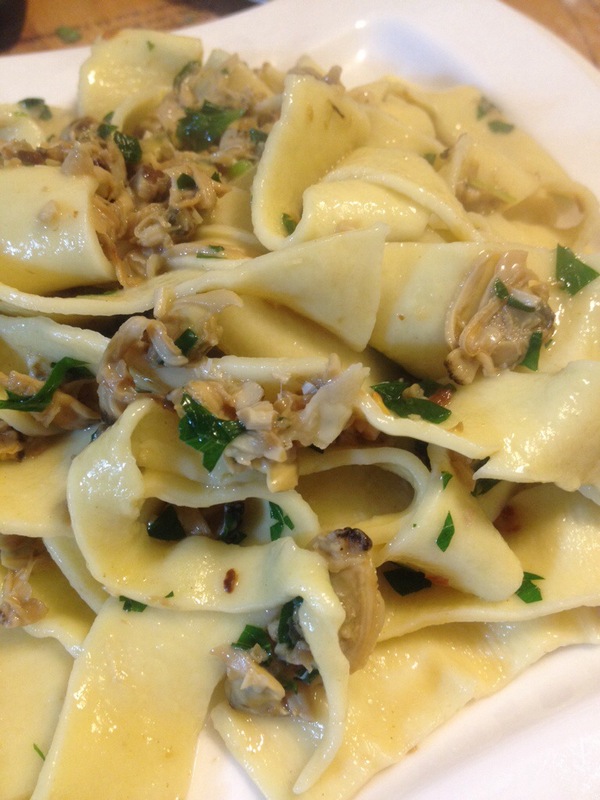 Save a few shells to use as a garnish.